Dr. A.S. Robinson, chairman of the local branch of the National Lifeboat Institution gave a most interesting lecture on “The Zetland Lifeboat,” the boat that has saved over 500 lives, in the Albion Terrace Methodist Church Schoolroom, Saltburn on Monday night. Dr. E.J. Burnett, who presided, said that Dr. Robinson was a very strong person to give the lecture as he had been the man who had rescued the old boat and got it housed; he was also a keen archaeologist. Turning to the old days, the speaker explained that there was a great deal of danger in going out in the old lifeboats. Apart from the danger of capsizing there was always the threat of the oars which after were thrown back into the boat and hit the rowers in the face. Always there was the menace to life. For example William Guy, who one hundred years ago last Christmas lost his life in the old “Zetland.” Dr. Robinson turned to an interesting side line and said that there was a tombstone in the Redcar Churchyard to his memory, and that all the pennies that were gained through those who entered the museum were being used to restore the tombstone which is in a state of decay. In the old days, he explained that there were many important ports round this area such as Whitby, Hartlepool, the Tees, and Dabholm. The latter, the Doctor explained was the name given to the mouth of the small beck which floes through West Dyke. In those days it was big enough to take the small coasters. Until quite lately small ships used to call at these ports, carrying coal and timber down to London. In 1808 Hutton wrote a book which he called “A Visit to Coatham,” and in this book he wrote that as many as fifty boats could be seen at one time off the coast. The weather in this district varies and one can never be sure when it will change, so that when these small boats were caught in a sudden gale all they could do was to steer for the sand at Coatham. They were not strong enough to fight against the elements. A good many of these boats were broken up and many lives were lost, but those that were successful in grounding on the sand were quite safe and just waited for a high tide to take them off. In one day there were as many as twenty four boats ashore. The earliest mention of Redcar was in 1281 when a ship was wrecked off the coast. A silver alms dish was found on the shore and is now installed in the church at Kirkleatham. The doctor surmised that it (something) well have been a relic of the Armada. All the inhabitants of Redcar earned their livelihood by fishing, and many were drowned when close inshore when their cobles were overturned. Later the “Birger” was caught in a sudden squall and the captain, seeing that he was unable to fight against it, turned the ship towards what he thought to be the mouth of the Tees. As he got closer he saw that it was Huntcliff so he put out again towards the open sea. However, he could not make it and was driven on to the Saltscar rocks and the ship became a total wreck within a matter of hours. Of the 13 men on board only two were saved. The lifeboat put out in the morning (she went ashore at 2 a.m.) but was of no use, failing to get to the men who were hanging on to pieces of timber floating about. Doctor Robinson illustrated with a picture how in the early part of the 19th century a plan was put forward to make a harbour of refuge between the two reefs of rocks that go out off Redcar, so great was the menace to shipping. The records kept in 1801 showed that during one hundred years there had been 380 ships either in difficulties or ashore on the coast: and between 1847 and 1851 there were 110 wrecks and 61 lives were lost. During the big storm of 1861 there were in all 61 wrecks and again many fatalities. In 1765 a Frenchman invented a boat which wouldn’t sink, and shortly afterwards a London coach builder made a boat that wouldn’t roll. He had cork round the tot, a heavy keel, and airtight cases for’ard and aft. In 1780 the “Adventurer” was wrecked off South Shields. The boat was very close to the shore and the inhabitants of that town were able to see the men falling into the sea and were unable to aid the. They were so horrified at this spectacle that they formed a committee which offered a prize of £2 – 2s – 0d for the man who could bring forward the most ingenious lifeboat. William Woodhouse won, and his model is still to be seen in the Museum at South Shields. However the committee did not think that his effort was first-class, and he was only awarded £1 -1s – 0d. Henry Greathead made the first effective lifeboat which he termed the “Original.” He had cork round the top, a heavy keel, and a broad beam, also six emptying holes in the bottom of the boat. Dr. Robinson explained that a lifeboat must have the following points: (1) It must be light in order to be launched quickly. (2) It must have a certain amount of weight in order to keep stable. (3) It must be wide so that it won’t upset. (4) It must have a keel to keep upright. The “Zetland” lifeboat had a crew of 19 and at one time carried as many as 32 persons to the shore from a wreck. With a home-made model of the “Zetland” the doctor showed all the points in its favour. It was the same at both ends and so could go either way; it had cork all the way round the top so that it would not be harmed if it was dashed against anything; and it had a “sea anchor.” This he explained, was an anchor which was dropped when they reached the breakers on the shore to stop the boat from being overturned. 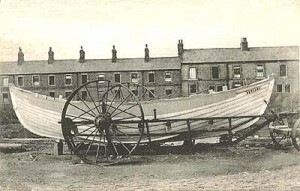 The “Zetland” was the third lifeboat to be built and was constructed in 1800. For its first two years of service it was stationed at Spurn Head, but in 1802 Lord Zetland bought it and gave it to Redcar, where it was in active service until 1869, long before the National Lifeboat Institution came into being. However in 1850 it was taken over by them, and in 1860 was condemned to be broken up. The fishermen wouldn’t have this and again Lord Zetland came to the rescue. He bought the boat and gave it back to the fishermen. It was left lying around for a number of years and the last service was in 1880 when it went to the help of the “Luna” which went on to the rocks off the Pier. Seven lives were saved. Dr. Mackinlay and Messrs. Meek and Groves, together with others, took charge of it and formed a trust. Groves died in 1918 and the “Zetland” was handed to the speaker (Dr. Robinson) who has looked after it ever since. He recalled that on the night of March 1 1804, residents of Redcar were aroused by heavy firing. Thinking the enemy was off the coast, drums were beaten to arms for assembly. The “Sea Fencibles,” commanded by Captain Thrush, were in short time present on the sands when proof was afforded that minute guns were being fired from the brig “Rose,” of London, which was stranded on the Redcar rocks. The lifeboat could not reach the vessel but fishing cobbles carried 20 people to the shore. He mentioned other wrecks, among which one in 1822 when a smuggling ship went ashore laden with gin. All were rescued (including the gin, with which the fishermen were rewarded. The “Caledonia,” which was wrecked off Marske with a cargo of granite became a total wreck, and Moore Street, Redcar was paved with the cargo recovered. These paving’s were removed only a few years ago. In 1834 the “Mulberry” went aground and the “Zetland” went out to her aid. However she was unable to reach the stranded vessel but George Robinson launched a small boat and succeeded in bringing the crew to land. In May of the same year he was presented with a silver tankard which is now in the possession of his grandson, Mr. William Dixon. Dr. Robinson showed it to the assembly. When the lifeboat put out to the rescue of the “Caroline,” the day when William Guy was lost overboard so powerful were the waves that 19 of the 22 oars were washed out. It is a local error to say that the Redcar boat was the only one on this part of the coast, as Hartlepool and Seaton had one in 1804. The last survivor of the “Zetland” crew, Tom Picknett died only the other year. Having finished his lecture on the boat itself the doctor turned to the crew and explained an interesting point. Most of them were called either Robinson, Fleck, Simpson, or Carter. They were relations of Captain Vook, whose mother and father lived and died in Redcar. Captain Cook’s three sisters married and their names became Carter, Fleck, and Simpson. Old illustrations and painting were then shown by the lecturer, even the drum which was used when a ship went aground. The secretary of the Saltburn association, the Rev. J. Toyn, thanked the speaker. COMPETITION – Rowing Match, Redcar.